Are YOU Ready to QUIT Smoking FOREVER?! 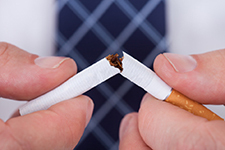 We are EXCITED to offer the latest in SMOKING CESSATION Hypnosis! Marc and Roger just completed advanced training in Smoking Cessation with the Legendary Don Mottin! Don is one of the most well known and well-respected Legends of Hypnosis and the Vice-President of the National Guild of Hypnotists. Marc and Roger are excited to share their knowledge with the Greater Danbury Area community and help everyone accomplish their non-smoking goals! Call now to schedule your life changing session today before the summer sessions have completely filled up! Our Non-Smokers package consists of THREE sessions to help permanently eliminate your desire to ever smoke again. You could pay up to $1200 for similar packages offered in this area BUT our package is ONLY $600 for THREE sessions! Call Now or Email us to book your OWN PRIVATE sessions!